So by no stretch am an expert at this game, but i understand the basics of crowed control, long paths, many towers, maze-like entrance, but even as i do all this i find that 1 of (sometimes 2) scenarios happen, either i keep the horde at bay, but starve to death or from exposure, or i get overrun and wiped due to lack of a proper defense. I understand that as the corruption grows so does the monsters ability to hurt me, but gimme an effing break, day 15 and im having to deal with every other monster being either flame elemental or specter? Am i expected to have migrants going somewhere by day 17 before i get overrun? This doesn't make sense, I understand the need for "end game" content spurring the need to make this game progressively harder bur ffs man come on tone down the monsters man. It's not gradual either, it seems that my pace is ok throughout the whole game, until day 17 at which point im screwed. My last game i had 6 each of bullet.bow,elemental towers upgraded to established (except elementals which were all fully upgraded). 12 Phantom darts upgraded to established, 6 Crystal Golem spawns fully upgraded with 2 recombob's on either side, day 16 the 18 fully upgraded Ess. Collectors were able to handle the load, but by Day 17 they all ran out of power halfway through the night now this is a typical set up i use and this is usually the outcome, in this particular match i had eclipse happen to me as well. I've literally doomed my map over 15 times at this point, this game is less enjoyable, and more tedious now.....wtf happened ray? I feel the same. You can barely survive the night 16, after that it's futile. There's a huge jump in the amount specters and fire elementals. I just got this game and I'm on day 30 and I just started building a maze a couple days ago, so I don't know what you guys are doing. Are you just letting the corruption expand and expand and build up more spawners or something? The corruption on my map is one big lake. They can't build anything on it, and fire elementals can't escape from it. Whew! I just experienced this in a major way. Playing on Newdragon, Survival difficulty, version InDev 31e, days 1-14 were a walk in the park: Just establish a perimeter and let the ballistae snipe the monsters as they trudge across the tar. On day 15 the number of monsters doubled overnight, causing them to punch through a wall and skip the maze. 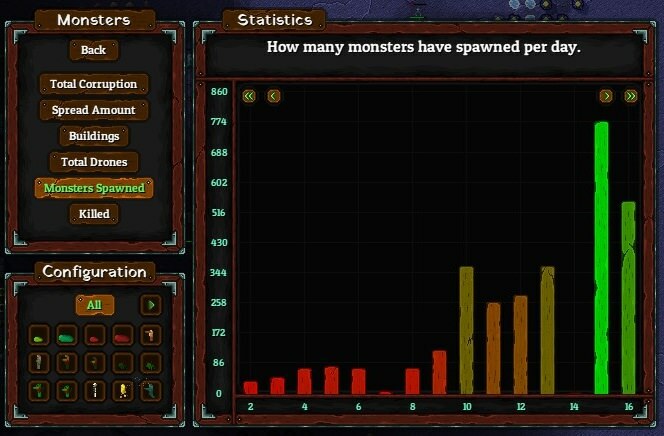 Between that and 150 spectres, I lost most my towers and a lot of housing and harvesting infrastructure. 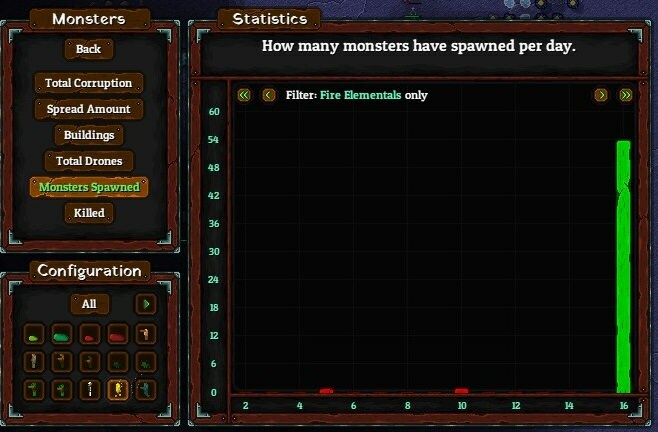 I rebuilt what I could, but on night 16 the monsters suddenly went from zero fire elementals to 54. They razed the remaining towers and murdered everyone. I'm not too sore about it because this was my first serious settlement and my next attempt will have better planning, especially for the various surprises (blood moon, spectres). But it felt a little nasty to have things turn so dramatically with the monster count more than doubling overnight. I smoothed out day 15->17 a bit in the latest Unstable patch, if you guys want to opt in and give it a shot.